A garage is often wired with only one or two centrally spaced light fixtures to illuminate the space. Perhaps you've added a workbench or storage area that requires additional light. Adding light fixtures to an existing light circuit can easily provide the needed lighting. Shut off the electrical power to the garage at the home's main breaker or fuse panel. Access the garage attic space or the ceiling joists from a stepladder (for unfinished garages) and determine the desired location for the new light fixture. For drywalled garage ceilings, use a screwdriver or awl to poke a hole through the drywall beside the ceiling joist at the new fixture location. Attach the electrical ceiling box to the side of the ceiling joist at the new fixture location. For a garage with a drywall ceiling, hold the ceiling box against the ceiling surface at the marked area and scribe the box outline on the drywall. Cut hole for the box using a jab saw. Position the ceiling box over the hole and attach the box to the side of the ceiling joist at the new fixture location using 8d nails through the box's nailing tabs. Measure the distance between the new fixture location and the nearest existing light fixture. Cut a length of 12-2 grounded wire to the measurement determined in Step 4 plus approximately 12 to 16 inches. Strip about 4 inches of sheathing from one end of the wire length using a utility knife and separate the three wires inside. There will be a black wire, a white wire and a bare or paper-wrapped copper ground wire. Strip about 1/2 inch of plastic insulation from the end of both the black and white wires. Remove the existing light fixture that the new fixture wiring will connect to. Remove the light cover, if applicable, the bulb(s) and detach the fixture base to access the circuit wire connections. Feed the separated end of the wire cable prepared in Steps 5 and 6 into the existing fixture box from above and extend the wire approximately 6 inches out of the lower side. Remove one of the electrical box's knock-out tabs, if necessary, to allow access into the box. Run the new fixture wire across the tops of the ceiling joists to the new fixture location and secure the wire in place with cable staples using a hammer. Remove one of the new ceiling box's knock-out tabs and feed the end of the new circuit wire into the box from the top. Cut the new circuit wire approximately 6 inches from the ceiling box opening using wire cutters. Strip about 4 inches of sheathing from the cut end of the wire using a utility knife and separate the three wires inside. As with the other end, strip about 1/2 inch of plastic insulation from the end of both the black and white wires. Reinstall the existing light fixture at its original location. Attach the black wire from the fixture to both of the black wires from the ceiling box and secure them with a wire nut. Connect the white wire from the existing light fixture to both of the white wires from the ceiling box and secure them together with a wire nut. Connect the ground wire from the fixture to both of the copper ground wires from the ceiling box and secure them with a wire nut. For ceiling boxes with a grounding screw in lieu of a wire nut connection, attach the ground wires to the ground screw and tighten with a screwdriver. Repeat Steps 11 through 13 to install the new light fixture at the new ceiling box location. 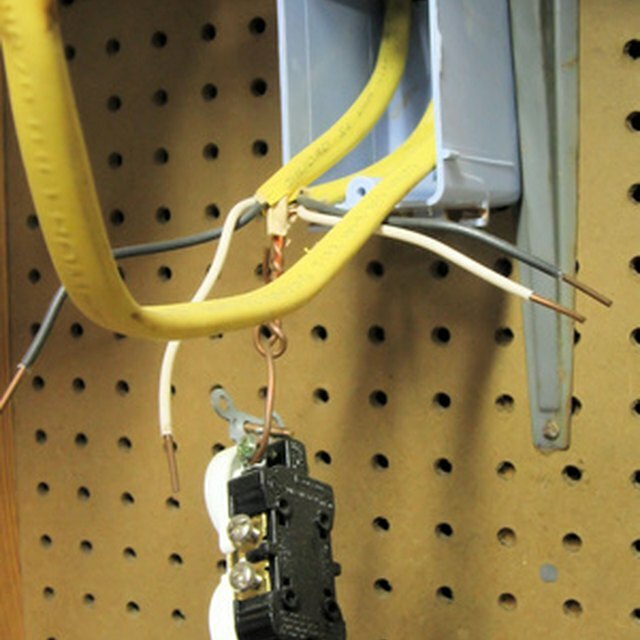 Restore the electrical power to the garage circuit at the main electrical panel. The designation "12-2 grounded" for the electrical wire refers to the sheathed wire being two 12-gauge wires with a bare copper ground wire included. The wire will have this printed on the plastic sheathing. If you are planning to install several light fixtures on the same wiring circuit, it may pose a safety hazard from overloading the circuit. Consult a licensed electrician if you have any doubts about the capacity of the wiring or circuit.